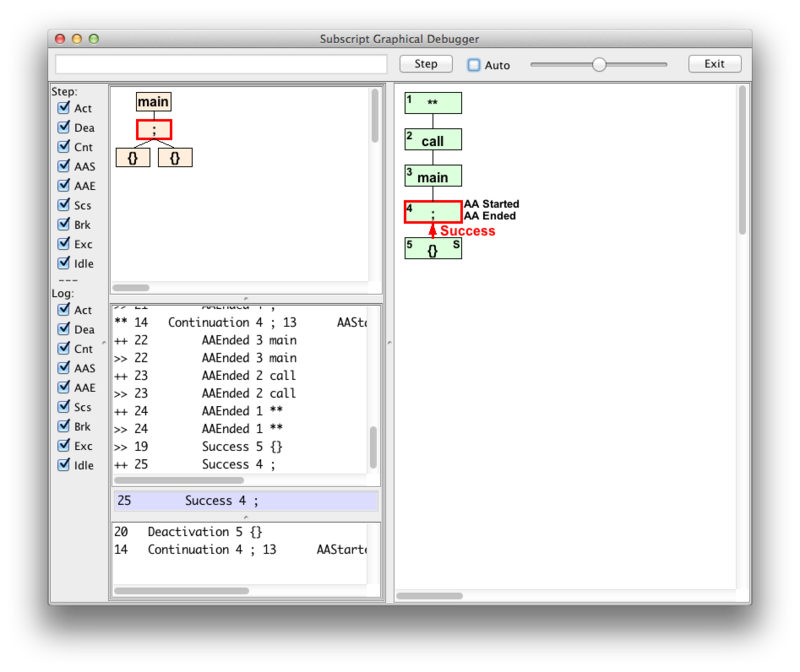 The SubScript debugger is a graphical tool that visualizes the execution of a SubScript program. It has been programmed in SubScript itself, thereby showing that multiple SubScript scripts may be run at the same time from Scala code. The panel on the right shows the call graph. A node has its name as main label; an index is at the top left; the top right shows an “S” if the node has a recent success. The current message being handled and the current node are depicted in red. On the right of n-ary operator nodes are deferred messages, i.e. messages that will be handled later, grouped in a “continuation” message. libraryDependencies += "org.subscript-lang" %% "subscript-swing" % "2.0.0"
Click the Step button to see how execution unfolds. You may “automate” this by checking the “Auto” check box; then the speed slider determines the pace. Deselecting some check boxes on the left may speed up the debugging.